Here is a teenager I treated with Tip-Edge braces and extraction of teeth including her compromised "steel crown". I treated her in 19 visits and closed the large molar space. We will keep her wisdom tooth #17 on that side. We achieved straight teeth, closure of her openbite and elimination of a lifetime of problems from a stainless steel crown. A posterior crossbite is a common malocclusion among patients. This means that the upper jaw is too narrow, lower jaw is too wide or both. An orthodontist is a specialist with 2 years of additional training over a general dentist and has the skills needed to determine the correct mechanics to correct this problem. Many orthodontists use a rapid palatal expander (RPE) to correct crossbites on many of their cases. These work well but are very bulky appliances which split the palatal bone and need to remain in place for six to twelve months. Although this appliance works, there are other ways to correct crossbites in many patients using braces alone with the knowledge of moments, forces and vectors. Remember physics? This is a patient that I treated back in 2010 without an expander. Notice how much wider his upper jaw is. Also his midlines are now perfect. If you have been told that you or your child need an expander you may be able to be treated without one. Let us know if we can help. When preteen patients have extensive tooth decay on their first molars their general or pediatric dentist will place stainless steel crowns to keep the teeth from fracturing. Crowns do not last forever and typically will need to be replaced every 10 years. There is also the risk of these teeth needing root canals. Rather than keep these compromised steel crowned teeth, it makes much more sense to extract these compromised teeth and keep the wisdom teeth. Many people think that most wisdom teeth need to be extracted and they usually are because of lack of space but if you give them space they will function just fine. 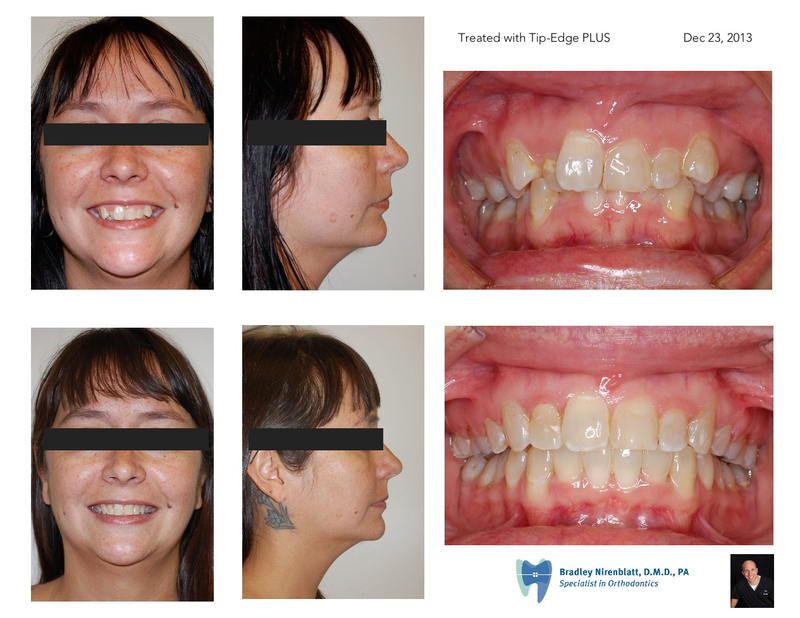 This patient was saved a lifetime of dental problems by having braces and extracting the four first molars. I corrected her bite as well. The last x-ray shows perfect root structure of her third molars which erupted later on and did not require any alignment. Will Invisalign work when teeth need to be extracted? Are patients that need teeth extracted due to crowding "candidates" for Invisalign? Will Invisalign work? The answers are yes in my office! Take a peek at this adult who I finished treating recently. Her teeth are completely straight and her extraction spaces are completely closed and roots are uprighted properly. Is her bite completely perfect? No, but it would be the same situation if she had traditional braces. To fix her bite would require jaw surgery which this patient declined. We improved her self confidence with a new pretty smile and certainly made it easier for her to clean her teeth improving dental health. I am excited about finishing this patient's treatment in 14 visits. 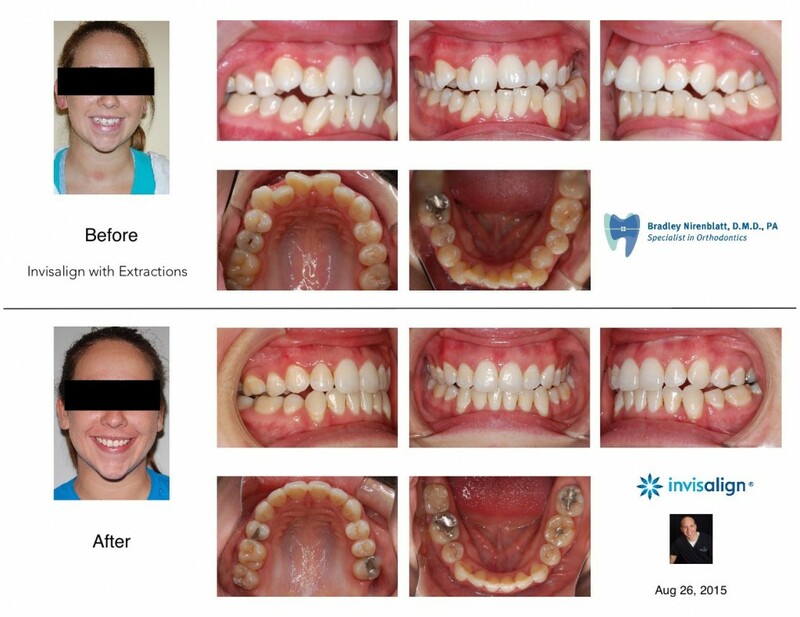 Her case would have been more difficult to treat with traditional braces because of her anterior openbite. Traditional braces tend to worsen openbites. Invisalign is the better choice in these cases. Also, it helps to have excellent patient cooperation! As a specialist in orthodontics, we treat patients of all ages; not just teens and children. In fact, about 50% of our practice are adults who seek us out to improve their smile. We enjoy treating adults because many of them have waited years to have treatment. Some of our patients tell us that their parents could not afford braces when they were teens. They are now ready to take care of themselves and their appearance. We also have parents that begin treatment after we have treated their own kids. They tell us, "Now it is mommy's turn." For these reasons and more, treating adults is especially gratifying. 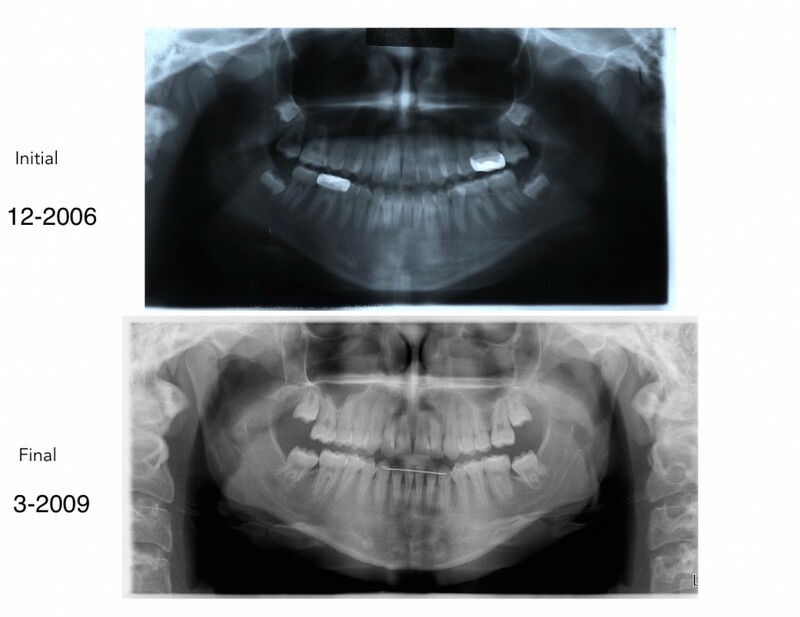 This patient required removal of two upper bicuspid teeth in order to align her teeth and improve her overbite. Her smile looks fuller after her treatment and there has been no flattening of her profile. Adult treatment requires more skills than treating just teens and children due to cessation of bone growth. We have been treating adults in addition to teens and children for more than 20 years. Let us know if we can help you! Years ago this would have been treated with a headgear or herbst appliance. I was able to distalize or move back all of his upper right teeth to make room for his right canine. I instructed the Invisalign techs how I wanted the teeth to move and at what rate. Needless to say, I wish I could have had this treatment when I had braces in high school! 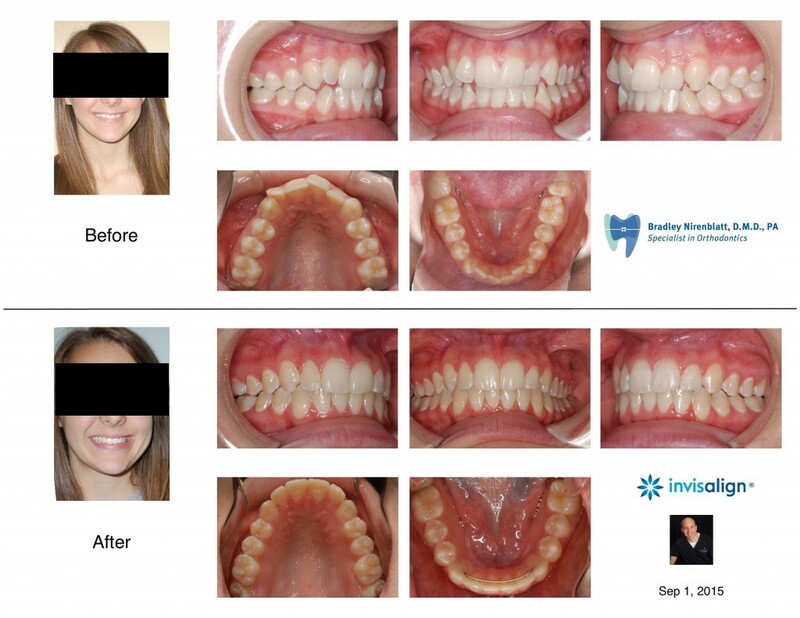 Did you think Invisalign would work on this patient? Patient question: What can I eat with braces? We love when patients ask us this question! Now that you’re wearing braces, it’s just as important to maintain a good oral hygiene regimen as you did before your orthodontic treatment began. The first few days in braces are going to be more difficult to eat than normal. There will be a slight discomfort when you first get your braces on, so the act of chewing will make it slightly more painful. Here are a few soft foods that do not require you to do much chewing and are easy to chew on when your teeth are sore. Ice cream, yogurt, pudding, cool soups, Jell-O, scrambled eggs, cream of wheat, baked potatoes, soft cooked pasta, soup, bananas, cottage cheese, smoothies, macaroni and cheese, pancakes, soft cheeses, and milk are all foods you can eat safely without having to worry about pain or breaking your brackets. Be sure to always check with us if you have questions about a particular food item by either giving us a call or asking us on Facebook! In this season given to tidings of comfort and joy, and as we reflect on the year that was, we’d like to ask you, our wonderful patients: What do you love about the holidays this year? Being with your loved ones? Hitting the slopes? A clean slate for 2013? Opening presents by the fireplace? All the delicious food? Also, what gift are you most looking forward to getting this year? We’d love if you shared with us all the things you love about the holidays. Stay warm, and don’t forget to limit the amount of sweets you eat! Need a New Year’s Resolution? How about a healthier, more beautiful smile? 2013 is almost here, and it’s a great time of year to get started on achieving a straight, dazzling and confident smile that will last you a lifetime. We are proud to offer some of today’s most innovative orthodontic technologies that can straighten your smile in less time than you ever imagined. Not only do today’s braces and other orthodontic treatments straighten your teeth quicker, they also offer greater comfort for you, and require fewer visits to our office. So if obtaining a healthy, beautiful smile is one of your New Year’s resolutions, we invite you to give us a call to schedule an initial orthodontic consultation. Happy holidays! Did you know there is a direct correlation between your bite and your overall health? When your teeth and jaws are not properly-aligned, it may affect your breathing, speech, and, in extreme cases, even affect the appearance of your face. As a result of malocclusion, also commonly referred to as “bad bite,” your teeth may become crooked, worn or protruded over time. Most people experience some degree of malocclusion, but it is generally not severe enough to require corrective measures. If your malocclusion is serious enough, however, orthodontic treatment may be necessary to correct the issue. Malocclusion may also be referred to as an underbite, crossbite or overbite. So, what, exactly, is the difference between the three? •	Crossbites, which can involve a single tooth or a group of teeth, occur when your upper and lower jaws are both misaligned, and usually causes one or more upper teeth to bite on the inside of the lower teeth. Crossbites can happen on both the front and/or the sides of the mouth, and are known to cause wear of the teeth, gum disease and bone loss. •	Overbites, also known as “overjet,” occurs when your upper teeth overlap considerably with the lower teeth. Overbites can lead to gum issues or irritation and even wear on the lower teeth, and are known to cause painful jaw and joint problems. Overbites can usually be traced to genetics, bad oral habits, or overdevelopment of the bone that supports the teeth. •	Underbites, which occur when the lower teeth protrude past the front teeth, are caused by undergrowth of the upper jaw, overgrowth of the lower jaw, or both. Underbites can also be caused by missing upper teeth, which can prevent the normal function of front teeth ( molars). This in turn leads to tooth wear and pain in your joints and jaw. Fortunately, we are able to treat bite problems. If you suspect you or your child has a bite misalignment, we encourage you to be examined at our office as early as possible. By starting early, you can make sure you or your child avoid years of pain and self-consciousness. Did you know that even in ancient times, people wanted to improve the look and function of their smiles? We think of modern orthodontic appliances as sleek, efficient technology, but this was not always so! Take a look at the highlights in the evolution of braces. •	According to The Angle Orthodontist, Aristotle and Hippocrates first thought about methods for straightening teeth between 400 and 300 BC. •	The Etruscans, in what we now know as Italy, buried their dead with appliances that maintained spaces and prevented collapse of their teeth and jaws during life. Archaeologists have discovered mummified remains in various locations that have metal bands wrapped around the teeth. •	A Roman tomb has also been discovered in which the teeth were bound with gold wire, including documentation on the wire’s use as a dental device. •	The French dentist Pierre Fauchard is acknowledged as the father of modern dentistry. In 1728 he published a book that described various methods for straightening teeth. Fauchard also used a device known as a “blandeau” to widen the upper palate. •	Louis Bourdet was another French dentist who published a book in 1754 that discussed tooth alignment. Bourdet further refined the blandeau and was the first dentist to extract bicuspids, or the premolar teeth between canines and molars, for the purpose of reducing tooth crowding. •	Orthodontics started to become a separate dental specialty during the early 19th century. The first wire crib was used in 1819, marking the beginning of modern orthodontics. •	During this period, gold, platinum, silver, steel, gum rubber, vulcanite, and occasionally wood, ivory, zinc, and copper were used — as was brass in the form of loops, hooks, spurs, and ligatures. •	Edward Maynard first used gum elastics in 1843 and E. J. Tucker began making rubber bands for braces in 1850. •	Norman W. Kingsley published the first paper on modern orthodontics in 1858 and J. N. Farrar was the first dentist to recommend the use of force over timed intervals to straighten teeth. •	Edward Angle developed the first classification systems for malocclusions (misaligned teeth) during the early 20th century in the United States, and it is still in use today. Angle founded the American Society of Orthodontia in 1901, which was renamed the American Association of Orthodontists in the 1930s. •	By the 1960s, gold was universally abandoned in favor of stainless steel. •	Lingual braces were the “invisible” braces of choice until the early 1980s, when tooth-colored aesthetic brackets made from single-crystal sapphire and ceramics became popular. As we arrive in the present, you need only look at your own braces to see how far we’ve come. Your treatment plan was probably created with a 3D digital model, and we’ve likely used a computerized process to customize your archwires. Perhaps you have clear aligners, self-ligating brackets, or highly resilient ceramic brackets with heat-activated wires. Orthodontics has come a long way from the days of Aristotle, and even the bulky wrap-around braces of just 60 years ago. Regardless of your specific treatment plan, the development of high-tech materials and methods has made it possible for your orthodontic experience to be as effective, efficient, and comfortable as possible. As you know, our office attended the Chili Cook Off on Saturday and it was a lot of fun, despite the very cold weather and wind! Lauren, our Scheduling Coordinator, made the chili that we entered in the Amateur division of the competition -- It was called White Lightning Chicken Chili. Those who bought tickets were able to walk to each entry's table and sample their chili, and everyone seemed to love ours! However, we didn't place in the contest. Regardless, we still had a great time and we look forward to doing it again next year! Thanks to everyone who came out to this fun event! Join Nirenblatt Orthodontics for the 13th Annual Celebrity Chili Cook-off & Oyster Roast this Saturday, November 17th! Our office will be entering the competition, and supporting the Charleston Animal Society. Purchase your tickets now and you will be able to taste delicious chili, shuck oysters, listen to music from amazing local musicians, and support a great cause! What more could you ask for? Tickets are $35 in advance for adults and $10 for kids. Adult tickets also include 2 drink tickets. There will also be a kids fun zone and adoptable animals from the Charleston Animal Society. This is a great opportunity to enjoy an awesome event and support a cause that helps so many animals each year! We look forward to seeing you all there! Thanksgiving is just around the corner, and Nirenblatt Orthodontics wants to lend a "Helping Hand" to the community. We have a food collection box located in our office and we are asking for patients to please bring in any canned or dry goods for a Thanksgiving dinner to be donated to Helping Hands of Goose Creek. We will begin accepting donations on Nov. 5th through Friday Nov. 16th. Patients will get 3 points per item donated and it is all going to a great cause! Please help us pay it forward. We have gotten some donations already, but we would love to really fill this big box with dry/canned goods! Bring us your items by November 16th and help us to make sure that these great families will have a Thanksgiving dinner! Pumpkin Contest Results at Nirenblatt Orthodontics! Here at Nirenblatt Orthodontics, we just ended a pumpkin decorating contest which ran for two weeks. Patients brought in painted pumpkins and we displayed them in the office for our patients to vote on them! We also posted the pumpkins on Facebook, and tallied up the Likes that each pumpkin received. You can see all of the entries on our Facebook page! We encourage you to take a look! We hope you all had a wonderful Halloween! Everyone wants a naturally aligned and beautiful smile, and it is no secret that orthodontic braces can help deliver one. However, there are greater benefits to wearing braces than just having straight teeth. You’ll gain many oral health benefits in addition to the cosmetic ones. One exciting part about wearing braces is getting to choose the colors of your rubber bands. Orthodontists place elastic bands, or ligatures, over each bracket to secure the archwire in place. These rubber bands may be individual or connected, depending on your mouth’s needs. You have the option of choosing the color of your elastics, which are changed about once every month at every visit. Our offices keep a color wheel handy to help you choose which ones suit you best! •	Red tones indicate that you are ready for action and take charge of your life with aggressive, forward-thinking steps. •	Blue tones are calm and relaxing. You are conservative and exhibit integrity when dealing with situations. •	Green tones represent growth and balance. You are level-headed and look for opportunities to grow emotionally and spiritually. •	Purple tones attract creative energies. You like to have fun and use your imagination in every aspect of your life. •	Orange tones indicate that you are optimistic and thrive in social situations where communication is open. •	Pink is a romantic color that represents a caring personality. You also enjoy having fun with silly games and endless laughter. When the time to remove your braces finally arrives, it is very exciting. Unfortunately, it can be somewhat confusing, too, because you are faced with choosing between two kinds of retainers. Should you go with permanent, removable, or a combination of the two? It is always wise to follow your dentist’s recommendations, but knowing more about the two types of retainer beforehand can be helpful. Removable retainers offer the advantage of easy use: you will generally put a removable retainer in at night and take it out in the morning. Regardless of your retainer schedule, you'll be able to enjoy some time with no retainer. However, a removable retainer can easily be forgotten at times, and this means you won't be taking full advantage of teeth retention. Another potential advantage of a removable retainer is that you can take it out and brush and floss your teeth with ease, which is more of a challenge with a permanent retainer. Although removable retainers can be very effective, they don't tend to be as effective as permanent retainers, especially if they are not used as directed. Because teeth begin to shift naturally as we age, a permanent retainer typically offers better long-term results for teeth straightening than a removable one. You can't forget to put it in — it's already there! Temporary retainers get lost or are forgotten on trips, and often fail to get used as often as they should be. Ultimately, the most important thing to remember is that wearing your retainer as directed is extremely important. As long as you follow our orthodontist’s advice, you will get the best results from your retainer, regardless of its type. I finished this young lady with Invisalign Teen. One of her chief complaints was her gummy smile. I definitely reduced it using Invisalign but needed a little more help. So I turned on my Radiosurgery unit and removed the remaining gingiva at the margin of her two upper central incisors. This procedure took 10 minutes with no bleeding . This was indeed the icing on the cake for her and I! Can you believe it's already October? For those who don't know, it’s National Orthodontic Health Month. This month-long event is organized by our pals at the American Association of Orthodontists, or AAO. Our team realizes that this is a great opportunity for us to raise awareness about the importance of oral hygiene. National Orthodontic Health Month also aims to recognize the dedicated work of orthodontists and other dental professionals. If you have any questions, please feel free to give us a call or ask us on Facebook. Have a fun and safe Halloween! Cold and flu season is upon us, are you prepared? It’s that time of year to start thinking about protecting yourself and your family from the flu. Here are some simple steps you can take to help yourself avoid colds and the flu this season. To promote a healthy and clean environment, our team gives a great deal of attention to sanitation and sterilization in our office at all times, as well as following all requirements for sterilizing instruments and work surfaces. For the protection of other patients and our staff, we always ask that patients reschedule their appointments if they have any type of cold or illness that can infect others. We hope this helps and give us a call if you have any questions! Stay healthy this beautiful autumn! Treat yourself to a new smile, no matter what your age! Did you know one in every five orthodontic patients is an adult? We’re living longer and technology is improving, making orthodontic treatment an appealing and safe option for patients of all ages. As the trend toward treatment later in life grows, we’re seeing braces on parents as well as children – and even adult celebrities such as Tom Cruise, Gwen Stefani and Nicholas Cage have shown off their braces. It’s never too late to look and feel your best! Can Braces Work for Adults? People of all ages can benefit from orthodontic treatment. The physical process for moving teeth is the same, young or old, which means it’s never too late to address issues such as an overbite or underbite, crooked or crowded teeth, or jaw disorders. If you’re considering orthodontic treatment, we’ll make a consultation appointment with you. During this meeting we will perform a general assessment of your oral health, discuss options for treatment, and answer any questions you may have. We will also discuss matters of cost and insurance. The next step is an orthodontic records appointment in which we take x-rays, photos, and an impression of your teeth. This information drives your unique treatment plan. Straightening your teeth can improve your smile, your self-esteem, and your dental health. Technologically advanced new treatments make it easier to identify the option that best fits your lifestyle. Modern techniques and materials have made braces and aligners more effective, comfortable and unobtrusive than ever. If you think you might benefit from orthodontic treatment, give our team a call, so we may set up a consultation to determine what type of treatment best meets your needs. Orthodontic braces are used to straighten the teeth, which not only creates a more pleasing appearance, but also helps prevent tooth decay and other oral health problems. Braces are only effective when they are properly cared for, however. Certain foods, for example, are better suited for individuals who have braces, as opposed to hard and sticky foods that can cause damage. So what types of foods should you or your kids eat to protect dental appliances? The best foods to eat with braces are those that are not high in sugar and do not require excessive chewing. For breakfast, try eggs, yogurt, bacon, wheat toast, or oatmeal. Lunch may steer toward a banana rather than an apple, a salad without nuts, and a glass of water. If you are looking for some after-school snacks for your kids, consider baked tortilla chips with salsa and guacamole, or try string cheese with fruit. A healthy dinner can include most types of vegetables, so long as they are cooked to an appropriate softness. Pair that with a lean protein, such as fish or chicken, and follow up with dessert. Just be sure to brush afterward! Regardless of what types of foods you eat with braces, it is important to keep the crevices between the teeth and around the braces very clean. That means brushing and flossing after meals to prevent the build-up of plaque and decay. Not only can failing to do so damage the teeth, but it can also cause discoloration. When we have patients with clear developmental problems at an early age, it’s best to start work when they are young, before the problems get bigger and more difficult to treat. In these cases we will start early and do one round of treatment – phase one – while the patient still has their baby teeth. Phase one usually does not involve braces, but can include a different type of appliance that helps the jaw grow into place properly. We’ll follow up with phase two usually a few years later, when permanent teeth are in place. Generally phase two involves braces. In order to catch early problems, we recommend that children have an orthodontic check-up no later than age seven (and so does the American Association of Orthodontists). However, if your dentist or pediatrician sees any sign that early treatment might be necessary, he or she may recommend your child visit our office even sooner. What questions should I ask during my orthodontic consultation? Are you thinking about orthodontic treatment to straighten teeth or correct jaw alignment? Consider making your first step an orthodontic consultation. During the consultation we will address your questions, concerns, and talk about a treatment plan that would best suit your situation. We want you to feel prepared and in charge of your orthodontic treatment decisions, so keep these questions in mind when you come in for your appointment. •	If I do need some adjustments to my teeth, what options will I have besides braces? •	What kind of preparation is needed to get braces? How many visits will it take? •	Can I expect any pain when getting braces? •	What determines how long I have to wear braces? •	How will braces affect my lifestyle? Foods I can eat? Activities I can do? •	Who will be involved in the orthodontic work? Whom can I expect to see during my adjustment visits? •	What will my orthodontic work cost? What is the ”average” cost and what could be the maximum? Your initial orthodontic consultation may just be the first step in relieving a lot of pain and discomfort in your life. Going in with the right questions will help you to understand the entire process and prepare you to do your part for your own dental health. Be sure to bring a list of your questions! Visibly crooked teeth are not the only reason to take your child into the orthodontist. There are some subtle things to look for as well, which may indicate the onset of more serious orthodontic issues. Many orthodontic issues are much easier to address if treated and corrected during a child's development. 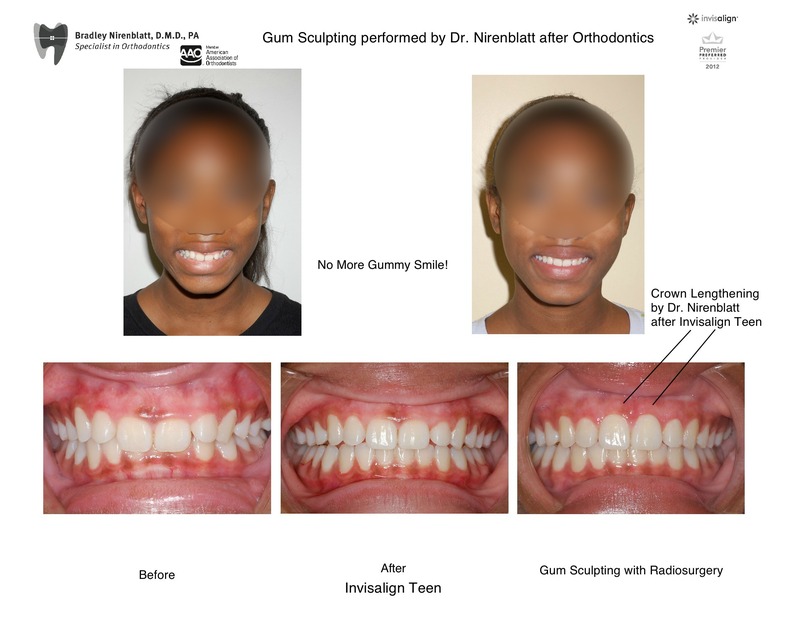 Waiting until facial development is complete or until the permanent teeth have come in can make correction of many orthodontic issues more challenging. Both children and adults can benefit from orthodontic care at any age, but addressing issues early is almost always the ideal choice. If you notice that either you or your child has one or more of these conditions, they could be signs that there is a risk of orthodontic or health problems. The sooner these problems are addressed, the wider and brighter you will be able to smile going forward! Nirenblatt Orthodontics wants to know, are you on Pinterest? There’s been a lot of buzz recently about Pinterest, a social media platform that allows you to share ideas on a virtual pinboard. This new social network is growing quickly and receiving a lot of media attention, so our team at Nirenblatt Orthodontics thought we’d give it a try. We are currently are adding pins to our boards, and would love to get your input. It’s inspiring to see and share images with you online and interact with our community through our social networks. So let us know if you’re on Pinterest and share your favorite things with us. Be sure to recommend your favorite pinboards to Dr. Nirenblatt and team. We look forward to sharing with you on Pinterest! Keeping your teeth from decay starts with a proper diet. Foods that are high in sugar or starch can cause more plaque, which is difficult to remove during your brushing. There are certain foods that should be avoided while wearing your braces. First, sticky foods like caramel or gum can get stuck in your braces and be difficult to remove during brushing. Next, hard foods such as nuts and candy could bend wires or even break a bracket. Foods that are firm or hard to bite into like apples, carrots, or corn on the cob should be avoided. As much as we like to snack on them, those crunchy treats can harm your braces. Things like chips, ice, and popcorn can also bend or break your braces. On the other hand, bananas, mangoes, milk, water, poultry, and pasta all tend to be low in enamel-busting acids. You want to place your toothbrush at a 45-degree angle against the gums in order to clean the whole tooth, and brush gently in the area between the wiring and the teeth. Use a softer toothbrush with fluoride paste for best results. Rinsing every day will help, too. Rinsing is important regardless, but especially important when you have braces as you need to disinfect the entire mouth, including those spots under the braces where your brush can't always reach. There are also special brushes, or other tools, to get under and clean your braces. You can find many of these items at your local pharmacy. It's important to keep your routine appointments with your dentist and dental hygienist for a thorough cleaning twice a year or as directed. The exact frequency of these visits will be up to your dentist as some types of braces are more demanding of a regular cleaning than others. As long as you practice good oral hygiene and follow these basic tips, you should have no problem keeping your teeth from decaying while you wear braces. Orthodontic treatments are used to correct malocclusion, a condition more commonly known as a bad bite. The length of treatment time varies depending on the severity of the bite problem. What is a "bad bite"? A bad bite occurs when spacing or alignment problems are present. This often includes teeth that are protruding, crowded, or crooked. Sometimes teeth appear straight, but have an uneven bite because the upper and lower jaws do not align properly. Teeth that are irregularly spaced - either too far apart or too close together - can also cause bite problems. Correcting a bad bite often creates a more attractive smile, which frequently raises the patient's self esteem. It also results in a healthier mouth. It is much more difficult to thoroughly clean teeth that are crooked, protruding, overlapped, or crowed. This may allow plaque to build up, which can lead to gum disease, tooth decay and even tooth loss. Orthodontic treatment corrects these conditions, so cleaning can be more efficient. An uneven bite can interfere with the motions of chewing and speaking. This can cause abnormal wear to tooth enamel, which may require pricey cosmetic restorative treatments, such as crowns or veneers, to correct. It can also lead to problems with the jaws. Orthodontic treatment lessens the likelihood of those issues, as well. Braces: Metal or ceramic brackets are bonded to the front of teeth. Wires and elastics are attached to the brackets to straighten teeth. Invisalign®: Advanced 3D computer images of the patients' mouth are used to create clear, custom aligners that slowly move teeth. They are nearly invisible and are more comfortable than traditional braces. They are also removable, which makes it possible to continue with normal brushing and flossing. Retainers: A retainer is a removable piece worn inside the mouth that uses pressure to force teeth to move into proper alignment. They are used after braces are removed. Treatment typically ranges from 12 - 36 months. Factors include the age, cooperation level, and growth occurrence of the patient. The complexity of the case also impacts the treatment time. When coming to our office to have braces put on, you may find yourself feeling a bit intimated and nervous about the experience. We hope to help you feel more at ease by explaining exactly what the different parts of braces are, and what they do. •	Elastic Tie — This is a very small rubber band, and it holds the archwire in place. •	Archwire — This is the main part of the braces. It is a wire guide that tracks the teeth. The wire may be moved from time to time during treatment to continue straightening a patient's teeth. •	Loop in Archwire — This is not in all braces. If it is used, it is to close a gap left from a tooth extraction. •	Bracket — This piece of equipment holds the archwire in place. Formerly, many patients used colored rubber bands to keep the brackets in place, but now since most brackets are cemented on, this is no longer necessary. •	Headgear Tube — This is a hollow area near the back bands, which allows the headgear to fit into the braces. This is only used on patients who require headgear. •	Coil Spring — If needed, this would fit between a bracket and the main archwire. Its purpose is to open up the space between the teeth. This is not necessarily used on all patients. •	Tie Wire — This is another piece of equipment that is used to keep the archwire in place. It is a thin wire that wraps around the bracket. •	Band — This is a metal band that fits completely around a tooth. It is used to help adhere brackets to the tooth. •	Hook — This is the piece of equipment that is used to attach the elastics, also known as rubber bands, around the bracket. 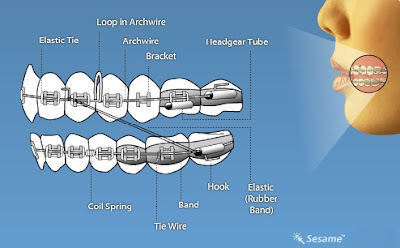 •	Elastic — These elastics are used to connect one point of the appliance to another. The purpose is to apply pressure, and encourage the teeth to move into the proper positioning. By defining each appliance we hope you or your child will be less apprehensive about getting braces put on. At the end of your treatment, you will have a bright, straight smile to show off to all of your friends. We’re halfway through the summer, and the summer months bring an increase in outdoor activities and a greater chance of kids damaging their precious mouths and pearly whites. If you play sports, it's important that you consult our office for special precautions, such as wearing a mouth guard. A protective mouth guard is advised for playing spring sports such as baseball, soccer, lacrosse and others. Be sure, however, to avoid mouth guards that custom form to your teeth as these will resist any tooth movements we are trying to achieve. In case of any accident involving the face, check your mouth and the appliances immediately. If teeth are loosened or the appliances damaged, please schedule an appointment with the office. And don’t forget to ask us about how you can get a mouth guard for yourself. Only by using a mouth guard and other forms of facial protection can kids with and without braces avoid serious sports injuries. Please give us a call if you have any questions about mouth guards or your treatment at our office. It’s hard to believe, but July is already here and half of 2012 has already passed! As July 4th approaches, our team thought it would be fun to share some facts and safety tips for celebrating our country’s independence day. • Betsy Ross, according to legend, sewed the first American flag in May or June 1776, as commissioned by the Congressional Committee. • The major objection to being ruled by Britain was taxation without representation. The colonists had no say in the decisions of English Parliament. • The first public Fourth of July event at the White House occurred in 1804. • And what could be more fitting than spending the day in a place called “America”? There are five such places in the country, with the most populous being American Fork, Utah, with 21,941 residents. Check out American Fact Finder. • Avoid buying fireworks that are packaged in brown paper because this is often a sign that the fireworks were made for professional displays and that they could pose a danger to consumers. • Keep a bucket of water or a garden hose handy in case of fire or other mishap. • Never carry fireworks in a pocket or shoot them off in metal or glass containers. • To prevent a trash fire, be sure to douse the spent fireworks with plenty of water from a bucket or hose after fireworks complete their burning and before discarding them. • Make sure fireworks are legal before buying or using them. Also, check out these 4th of July party invitations, eGreeting cards, and delicious recipes! Orthodontic Emergency? We can help! True orthodontic emergencies are very rare, but when they do occur we are available to you. As a general rule, you should call the office when you experience severe pain or when you have a painful appliance problem that you can't take care of yourself. We’ll be able to schedule an appointment with our office. Poking Wire: Using a pencil eraser, push the poking wire down or place wax on it to alleviate the discomfort. Loose Bracket or Band: If your bracket or band is still attached to the wire, you should leave it in place and put wax on it. If the wire comes out entirely, wrap the bracket with a tissue. Loose Wire: Using a tweezers, try to place your wire back into place. If doing this and using wax does not help, as a last resort use a small fingernail clipper to clip the wire behind the last tooth to which it is securely fastened. If your discomfort continues, place wax on it. Loose Appliance: If your appliance is poking you, place wax on the offending part of your appliance. Headgear Does Not Fit: Sometimes headgear discomfort is caused by not wearing the headgear as instructed by your orthodontist. Please refer to the instructions provided by your orthodontist. If the facebow is bent, please call our office for assistance. Surprisingly, headgear becomes more comfortable the more it's worn, so be sure you’re getting in the prescribed hours. General Soreness: When you get your braces on, you may feel general soreness in your mouth and teeth may be tender to biting pressures for three to five days. This can be relieved by rinsing your mouth with a warm salt water mouthwash. Dissolve one teaspoonful of salt in 8 ounces of warm water, and rinse your mouth vigorously. If the tenderness is severe, take aspirin or whatever you normally take for headache or similar pain. Remember, after alleviating your discomfort, it is still very important that you call our office as soon as possible to schedule a time to repair the problem. The number one goal of orthodontic treatment is to give you or your child a good bite, meaning straight teeth that work well with the teeth in the opposite jaw. A good bite makes it easier for you to eat, chew and speak. It can enhance your dental health and your overall health, and may well improve your self-esteem. As a part of your comprehensive dental health care plan, orthodontic treatment can help you retain your teeth—and your smile—for a lifetime. Let your smile express yourself! Nothing can show the world how happy you are quite like a beautiful smile. In fact, it’s one of the first things others notice about you, too. With orthodontics, you can be proud to flash your smile, because you’ll know that your smile truly represents your positive attitude. Make your mouth healthy! Straight teeth aren’t just pretty, they’re healthy as well. Teeth that are properly aligned are easier to clean, reducing the amount of plaque buildup and risk for gingivitis. The cleaner you keep your teeth, the longer they’ll last! Feel free to live your life! Orthodontics is easier today than ever before, with treatment options that fit your lifestyle and schedule. We can personalize your treatment to suit all of your needs! June marks National Dairy Month! In honor of June Dairy Month, our team would like to thank all of our hard working families in the Dairy Industry. In fact, dairy is important to your overall health! A 2008 study from the American Academy of Periodontology (AAP) found that regular consumption of dairy products, such as milk, cheese and yogurt, can lower your chances of contracting periodontal disease (also known as gum disease). Results of the study show that adults who consume at least 55 grams of lactic acid a day are less at risk for gum disease. Eating dairy is not just healthy for building strong bones, but is essential for maintaining a strong, healthy mouth. Questions about which foods you should steer clear of and which you should enjoy during orthodontic treatment? Give us a call or ask us on Facebook! We know that having an attractive smile puts a spring in your step—or two—as well as increases your self-confidence, no matter if you’re 14 or in your late forties. Smiling not only makes people happy and puts them in a good mood, doing it often can even help you live longer, according to previous studies! If you’ve been hiding your smile because you have crooked teeth or gaps between your teeth, it’s time to consider orthodontic treatment at our practice. You’ll be pleasantly surprised to learn how quickly and efficiently today’s most advanced correction techniques can straighten your smile! Don’t hide your smile any longer — give us a call today to schedule yours or your child’s orthodontic consultation. May is National Teen Self-Esteem Month! At our office, we know image can be everything. At an age when image is so important, the thought of having braces may intensify the already-delicate confidence of today's teens. Well, May is National Teen Self-Esteem Month, and during this time, parents are encouraged to act as positive role models, help stop negative self-images, and improve confidence and security among teenagers. One of the great ways to improve your confidence is to improve your smile. And that begins with a consultation at our office. After all, what better time to avoid having crooked teeth in your adulthood than coming in for a consultation? We invite you to give us a call to schedule a consultation or ask us on Facebook! Celebrating Earth Day by Doing Our Part to Help the Planet! We are living in an age with a renewed commitment to conservation, and are frequently reminded to recycle, reduce and reuse. Last Sunday marked Earth Day, so today we thought we would discuss some of the things we do to conserve our natural resources and the environment. Our office is digitalized, which means we can operate without the use of large amounts of paper and printing materials. The information in our office can be sent and processed digitally, which is also more efficient. We take all of the steps possible to be a 'green' office, making us better for the planet and more convenient for our patients. We would love to hear how you minimize your impact on the environment. Leave us a comment below or post on our Facebook page! The number one goal of orthodontic treatment is to give you or your child a good bite, meaning straight teeth that work well with the teeth in the opposite jaw. A good bite makes it easier for you to eat, chew and speak. It can enhance your dental health and your overall health, and may well improve your self-esteem. As a part of your comprehensive dental health care plan, orthodontic treatment can help you retain you teeth—and your smile—for a lifetime. Feel free to live your life! Orthodontics is easier today than ever before, with treatment options that fit your lifestyle and schedule. From clear braces to removable aligners and totally invisible lingual (behind the teeth) braces, we can personalize your treatment to suit all your needs. Spring is in the air! As you probably know, you can always connect with us on our Facebook page, but we invite you to please contact our office with any updates to phone numbers and addresses, so that we may be able to reach you. We also encourage you to call us and let us know if you have any new phone numbers or if your contact information has changed! Thank you! Have a great weekend! Visiting your dentist during your orthodontic treatment will not only help keep your teeth and mouth healthy while you have braces, but will also help keep the rest of your body healthy. The fact is, every hour of every day in the U.S., someone dies of oral cancer, which is the sixth-most common diagnosed form of the disease. The five-year survival rate is only 50 percent, and oral cancer is one of the few cancers whose survival rate has not improved. Since April is Oral Cancer Awareness Month, we would like to take this opportunity to remind all of our patients about the importance of maintaining good oral hygiene while you’re undergoing orthodontic treatment. Your dentist is specifically trained to diagnose, treat, and prevent oral health problems. Please let us now if you have any questions about your oral health during your next adjustment appointment. Take care of your teeth! Did you know that back in 2002, Tom Cruise had braces? During this time, he was 40 years old and filmed Minority Report, Austin Powers in Goldmember and the Last Samurai. Check out his smile in Jerry Maguire, Rain Man or The Firm and compare to the post-braces Tom Cruise in Valkyrie or Tropic Thunder. The fact is, movie stars need to look their best for the silver screen, and it wouldn't be possible without orthodontists like Dr. Nirenblatt. In fact, lots of Hollywood stars have had orthodontic treatment. Check out this slideshow of famous faces with braces. If you’ve thought about getting the perfect smile you’ve always wanted, please give Nirenblatt Orthodontics a call. What do rubber bands do? Rubber bands, or elastics, can be an integral aspect of orthodontic care, so if Dr. Nirenblatt has prescribed elastics as a part of your treatment, it’s important to follow the directions fully. Elastics help to align your bite or cause teeth to move in different directions and straighten more quickly. We will instruct you how to hook one end to an upper bracket and the other end to a lower bracket so the rubber band goes vertically or diagonally from one bracket to another. The tension of the rubber band produces pressure on the bracket, which causes the teeth to move and straighten. This tension is also sufficient to correct an overbite or an under bite in the jaw. If rubber bands are a part of your treatment plan, there are a few things to keep in mind. With rubber bands, you won’t be able to open your mouth fully, so they will have to be removed when you eat and reapplied after meal time. Many times, rubber bands are only needed at night, so you won’t need to worry about eating with them. Also, if you try to open your mouth too wide, your rubber bands might snap – so be careful! Failure to wear your elastics full time or as instructed can lengthen your treatment time and may make it more difficult to achieve an optimal result. But don’t worry; your time in elastics will be well worth it when you see your beautiful, new smile. Connect with Nirenblatt Orthodontics on Facebook! We’ve rolled out our new Facebook Timeline page and would love for you to check it out! You’ll find all the useful information that was there before, but now in a fun, new layout. When you connect with us on Facebook, you’ll be able to check out photos of our office, find out about new events and contests, or you can even leave a note about how much you enjoyed your visit at our office. We love hearing your feedback to make our practice serve you and your family even better. To make life even easier, if you “Like” us on Facebook, you’ll automatically receive updates from our office right on your own news feed! In fact, you will get all of the updates about our current contests at Nirenblatt Orthodontics! We have different monthly contests in our offices, and for the month of March the contest is: How many gold coins are in the jar? The winner will receive 4 tickets to Magnolia Gardens and 5 smile tokens! Stop by the office and make a guess. At Nirenblatt Orthodontics, we strive to provide our patients with only the best in orthodontic care in a comfortable, friendly and informative office. Today we took some time to answer questions about what patients can expect when they start treatment at our office. Do you take the time to explain options to your patients, and what each procedure entails? Yes, we always make time to explain everything that is going on. Do you partner with your patients other dental professionals to make sure they receive superior treatment? Yes, we stay very close in contact with our patients' other dental professionals to ensure the best treatment possible. Do you use state of the art technology to make procedures more efficient and cause less discomfort? Yes, we have the latest technology possible to make our patients' treatments more understandable and as comfortable as possible. Such as, videos for all procedures, whether it be a more of a severe case like extractions needed or an easy case like elastic wear. We make it as easy to understand for our patients as we can. Do you offer extras like wireless Internet access, coffee or snacks? We do not provide Internet access at this time, but are thinking of providing it in the future. We do, however, supply lots of goodies at our snack bar and always have the coffee on and ready to go. Do you have incentive programs to help your patients stay motivated about good oral health? We sure do! We have a Smile Tokens Reward Program, which means that every time our patients come in for their appointments and have good oral hygeine, wear their Nirenblatt Orthodontics t-shirts, are wearing their elastics according to treatment plan, etc...they will receive up to 2 or 3 smile tokens per appointment and are able to cash them in at anytime to receive one of our many prizes! But, that's not all! We are in the process of getting a NEW and MORE EXCITING rewards program. So stay tuned for more information on the new and upcoming rewards program!! Do you do anything that you feel sets you apart from other doctors in the area? Yes, we offer NO down payments and some interest free monthly payments! If you have any questions about our practice, or would like to schedule a consultation, give us a call today! What do we expect out of our patients? How can patients improve the way they approach treatment? •	For patients to be well informed and to visit our website, which includes a lot of information on all the different options for treatment. How can Doctor-Patient relationships improve? Just getting to know us better and communicating with us more so that we can really learn about the patient and get to know each other. What qualities make for a great patient? Have another question? Just ask! You can contact us at the office or visit us on Facebook. More great reviews for Nirenblatt Orthodontics! Nirenblatt Orthodontics, serving North Charleston and the surrounding areas, has been receiving some great patient reviews lately! Check out what our current patients are saying about Dr. Nirenblatt and team! The initial visit far exceeded our expectations. The staff was very friendly. The level of service was unbelievable. We were given a break down analysis of everything and left the office feeling knowledgeable. This office raises the bar compared to other offices that we visited. Outstanding job, guys!" My daughter had braces for two years from another orthdontist. i took her to Dr. N. He did the intial exam and then gave me her treatment requirements. Not only did she have crooked teeth, she also had a mandibular prognatism. She just had her braces removed a week ago and Lauren has a beautiful smile and her prognatism is virtually non existant. An excellent Dr. and staff!" Everyone is always very friendly everytime we go in for an appt. We never have to wait long and treatment is always explained. I recommend them to all of my family and friends." "I just finish my treatment and i would like to say thank you and that i rarely had any problems during the whole thing..i'm glad i came here an i recommend them to anybody." I would recommend Dr. Nirenblatt to anyone who is seeking orthodontic work. If I did not believe in his work, I would not be bringing my thrid child to him for braces. The whole office is very professional and will answer any questions you may have. I have never had any problems with his work and respect him and his knowledge as an Orthodontist." Thank you for all of the kind words! If you have any questions about our practice or your orthodontic treatment, give us a call or ask us on Facebook. Dr. Bradley Nirenblatt of Nirenblatt Orthodontics is proud to sponsor the News 2 Cool School Program! News 2 and Dr. Nirenblatt are excited to congratulate Beech Hill Elementary on receiving the Cool School Award. "The school met AYP three years in a row, and rated excellent on the state report card. Beech Hill Elementary is a Palmetto Gold Award winning school, and has nearly forty business partners, and has nearly thirty Wednesday Early Release Day clubs, including service, sign language, and juggling clubs." 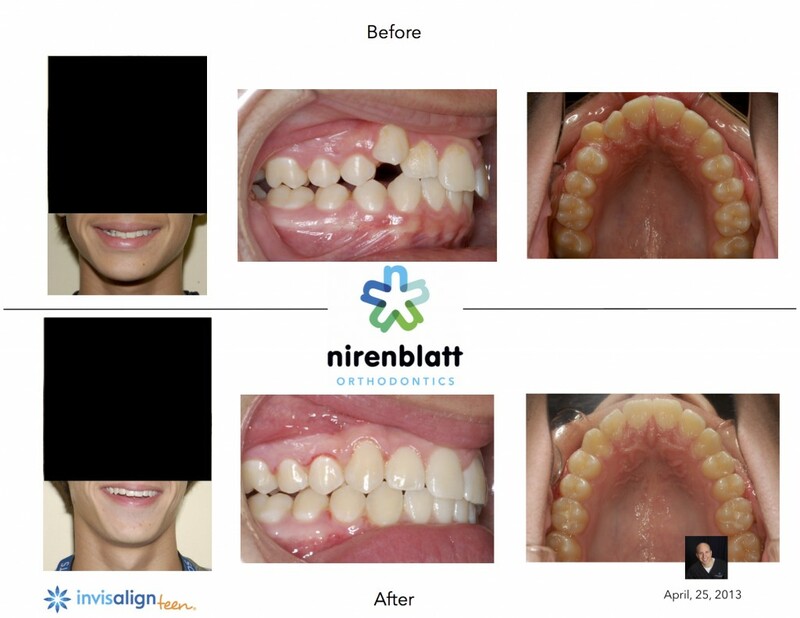 What are patients saying about Nirenblatt Orthodontics? Dr. Bradley Nirenblatt and our team love getting patient reviews. And lately, Nirenblatt Orthodontics, serving Charleston, SC and the surrounding communities, has been getting some pretty great patient testimonials! We thought we'd share some with you today! Happy Tuesday! Thank you for all your help"
I am just starting Invisalign braces. The staff has been very pleasant, helpful in answering questions, going over what to expect good or bad. I had another ortho consult and they wanted a down payment of $1,200 for the Invisalign braces which I could not afford. I would have had the traditional braces because of the cost. Thanks to Dr. N. I can have almost invisible braces and in a shorter time." I was so thrilled yet nervous about my consultation with Dr. Nirenblatt, but as soon as I walked through the door and realized how friendly everyone was, it calmed me down! Everything about my appointment was awesome, from the time I walked in to the time I walked out. Everyone I came in contact with was very professional and helpful. Charline was very thorough when it came to the treatment as well as the financing for my treatment. She was also very patient and understanding when it came to my 2 year old daughter not wanting to listen! Dr. Nirenblatt and his team have me sold, and I'd recommend this orthodontist to anyone!" Dr. N and his staff are very wonderful people! It was my first visit but they made me feel like I was part of the extended family for a long time. Looking forward to seeing them more often during my treatment! Thanks guys!" I was very pleased with my treatment at Dr. Nirenblatt's office. He and his staff are very professional and knowledgeable. They explained each step as I was getting my braces and provided excellent after-care instructions. I am very excited about future visits as I embark on this journey towards my "perfect" smile. :-D"
Thank you for all of your kind words! Dr. Bradley Nirenblatt and our team know having an attractive smile puts a spring in your step—or two—as well as increases your self-confidence, no matter if you’re 14 or in your late forties. Smiling not only makes people happy and puts them in a good mood, doing it often can even help you live longer, according to previous studies! If you’ve been hiding your smile because you have crooked teeth or gaps between your teeth, it’s time to consider orthodontic treatment at Nirenblatt Orthodontics. You’ll be pleasantly surprised to learn how quickly and efficiently today’s most advanced correction techniques can straighten your smile! Dr. Nirenblatt offers a variety of orthodontic treatments, all customized to create the best results possible. As an Invisalign® Preferred Provider, he has worked with hundreds of patients to help them achieve a straight smile without sacrificing aesthetics and convenience. In addition to Invisalign and Invisalign Teen™, Dr. Nirenblatt also offers traditional clear braces, In-Ovation® Lingual Braces, temporary anchorage devices, and Tip-Edge Plus System of braces. Don’t hide your smile any longer—give us a call today to schedule yours or your child’s orthodontic consultation. Why do you choose Nirenblatt Orthodontics? Nirenblatt Orthodontics, serving North Charleston and the surrounding areas, strives to provide exceptional treatment in an informative and friendly environment. Have you had a great experience at our office? Just select the "Review Us on Google Places" button above to write a review on our Google Place Page. We look forward to receiving your feedback! Thanks to Invisalign, you can have a perfect smile without metal wires or brackets! At Nirenblatt Orthodontics, we know image is everything. For many people, the thought of having metal brackets and wires attached to their teeth for two or more years may be more than enough to delay orthodontic treatment. If you’ve been considering straightening your teeth but are apprehensive about metal wires and brackets getting in the way of your smile, Invisalign treatment at Nirenblatt Orthodontics may be a great solution. Invisalign, which straightens teeth through a series of clear, custom-fit removable aligners, does so in a way that is discreet and hardly noticeable. If you have questions about Invisalign, or would like to find out if you are a candidate for Invisalign treatment at our office, please give us a call to schedule a consultation with Dr. Bradley Nirenblatt. Many folks consider the beginning of a new year a time to not only reflect on the year that was, but also to set personal goals for the upcoming year. How are you planning to improve your health and happiness in 2012? Dr. Bradley Nirenblatt and our team recommend that you make a New Year’s resolution to benefit your oral health! It is important that New Year’s resolutions are reasonable and attainable, and that they improve your overall quality of life—for example, did you know that flossing every day is the very best way to prevent periodontal, or gum, disease? Using a straw when drinking sugary beverages can also help prevent cavities. There are many small steps that you can take to prevent cavities, oral infections and bad breath. Be sure to give us a call if you need a few suggestions on ways to improve your oral health—we want to hear from you! After all, we know your oral health is about more than just a beautiful smile. The year is almost over, so we wanted to ask what was memorable about 2011 for you, and what are you looking forward to in 2012? Do you have a new year's resolution, or any exciting plans for the coming year? Have a safe and happy New Year, from Nirenblatt Orthodontics! Beware of those holiday goodies! At Nirenblatt Orthodontics, we know maintaining a healthy diet over the holiday season can prove a difficult task. After all, who can resist the tasty treats of Christmas? With grandma and everybody else offering you candy, chocolate logs or Christmas pudding, you just can’t say “I’ll pass” each time. But trouble lurks: every time you chow down on that chocolate or candy, the bacteria in your mouth have a feast on the sugar—at your expense. The sugar turns into acid, and the acid eats away at the enamel on your teeth and between your braces. Then, you start getting cavities. Instead, try fudgy cocoa bites, marvelous molasses cookies, wonderful waffles or other braces-friendly recipes, courtesy of the American Association of Orthodontics, or AAO, and “The Braces Cookbook” by Pamela Waterman. If you must indulge in chocolaty goodness this Christmas or holiday season, remember to brush your teeth after eating sugary treats. Hope this helps! Give us a call if you have any questions! Dr. Bradley Nirenblatt knows image is everything. At an age when image is so important, the thought of having metal brackets and wires constantly attached to teeth may intensify the already-delicate confidence of today's teens. But... not to worry! There is a clear alternative to traditional braces! The team at Nirenblatt Orthodontics thought we'd remind you that Invisalign Teen™ gives you a whole new way to wear braces for a "clearly" amazing smile! So how does Invisalign Teen work, you ask? Much in the same fashion as Invisalign, but with a few added characteristics tailored specifically to teenagers’ lifestyles. For instance, Invisalign Teen is designed with “compliance indicators” that fade from dark to light during the two week period that particular tray is used and once it has faded teens know to change trays. Each aligner comes with up to six free individual replacement aligners in case the original aligner ends up lost or broken. Another big benefit for the patient! The treatment period for Invisalign Teen varies from nine to 18 months. If your teen is considering orthodontic treatment, please contact us and we’ll answer any questions you may have about Invisalign Teen. At Nirenblatt Orthodontics, we know nobody likes getting plaque on their teeth. Here are five other ways you can avoid that dreaded enemy of the teeth during orthodontic treatment, courtesy of WebMD. Let’s start with brushing regularly. Brushing your teeth twice a day with a fluoride-containing toothpaste is vital to a healthy mouth. Make sure you softly brush all the surfaces of your teeth. Next on the list is flossing daily: a simple daily flossing between teeth clears away plaque before it can cause damage and can also clean plaque at the gum line. Plaque is known to reach the spaces between teeth. Also, evading a trip to the dentist is probably not a great idea. Let’s say you brush and floss daily. You’re still at risk for plaque. With time, the plaque hardens and turns into tartar. Consider visiting your general dentist at least twice a year or as recommended by your dentist, and you have a lower chance of getting cavities or losing your teeth while wearing braces. You’ll also want to stop avoiding those fruits and veggies. Believe it or not, there are foods out there that play a key role in keeping plaque off our teeth. They include apples, carrots, cucumbers and other raw fruits and vegetables. You can still eat these types of fruits and veggies if you have braces, but be sure to cut them up into bite sized pieces to avoid breaking off brackets. Finally, before you pick up that candy bar, remember to not give in to your sweet tooth. Consuming sugary drinks or eating candy or other junk food allows sugar to stick to our teeth. The bacteria, then, becomes plaque, which turns into acid and damages our teeth. Avoiding these five bad habits keeps your plaque in check and your mouth as healthy as can be during your orthodontic treatment with Dr. Bradley Nirenblatt. If you have any questions, give us a call or ask us on Facebook! Whether you just began your orthodontic treatment at Nirenblatt Orthodontics and have a follow-up question for Dr. Bradley Nirenblatt or team, or if you’d simply like to drop us a quick line, we’d love to hear from you! We love connecting with our patients online, whether it’s by sharing news on our blog or communicating ideas on our interactive Facebook page. Happy Thanksgiving from Nirenblatt Orthodontics! With the hustle and bustle of the holiday season knocking at our door, Dr. Bradley Nirenblatt and our entire staff at Nirenblatt Orthodontics wanted to stop for a moment and extend our best wishes to you, our patients, referring doctors and families, for a wonderful Thanksgiving. We also want to extend a special "Thank You" to all of our military families and to those who are serving in our armed forces overseas and at home. We are so thankful for your service. Our office wishes you a happy and safe Thanksgiving. We hope that this Thanksgiving and holiday season brings fond memories. Thank you for being part of our family. Dr. Nirenblatt is the "Talk of the Town"! Congratulations to Dr. Bradley Nirenblatt for being a Talk of the Town Winner in the "Orthodontists" category! Our team at Nirenblatt Orthodontics loves working with Dr. Nirenblatt to create new, healthy smiles in a welcoming and comfortable environment. There are a variety of foods Dr. Bradley Nirenblatt wants you to avoid while you're wearing braces. Some foods can occasionally damage braces, but certain foods can bend the wires or even break the brackets on your braces. If you’re wearing braces, you should avoid starch, sugar and gummy foods, as these foods can be difficult to remove during brushing. Foods that are high in sugar and starch tend to cause plaque, cavities and even tooth decay. Avoid tough meats, hard breads and raw vegetables such as carrots and celery. Before long, you'll be able to bite a cucumber again. But you'll need to protect your orthodontic appliances when you eat for as long as you're wearing braces. Also, chewing on hard things (for example, pens, pencils or fingernails) can damage the braces. Damaged braces will cause treatment to take longer. If you have any questions on which foods you should be avoiding and why, we invite you to give Nirenblatt Orthodontics a call or ask our staff during your next visit. Nirenblatt Orthodontics is excited to announce that we will be participating in the Warm Feet Happy Hearts donation program. It is a ministry dedicated to providing socks to children so that their feet are warm and their hearts are happy this winter. We will have a donation box available at our North Charleston office, but we will be accepting sock donations for those in need at either location. Donations of packages of new socks (all sizes) are gladly accepted and appreciated. To learn more about Warm Feet Happy Hearts, visit their website. Last year the program collected 5,184 pairs of socks! Thank you in advance for helping us support this wonderful cause! Ask Dr. Nirenblatt: Why are straight teeth so important? 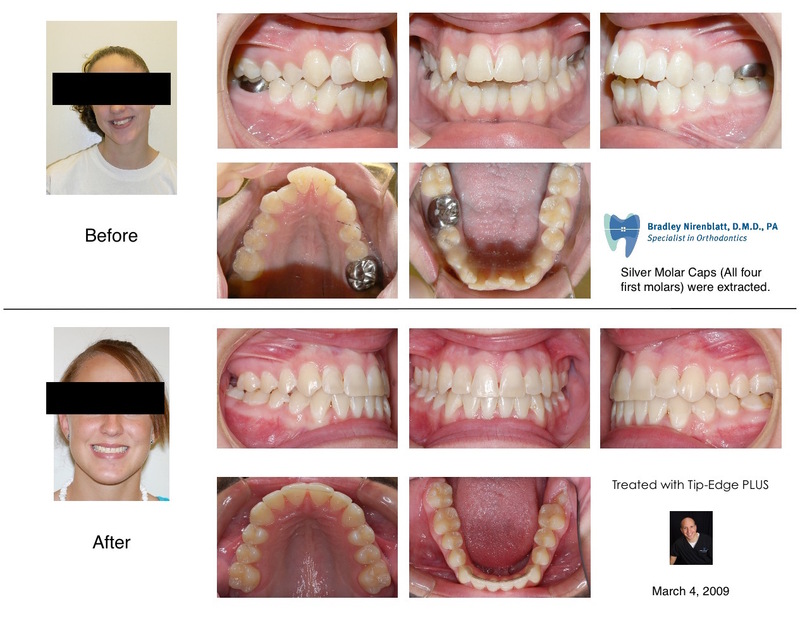 Some people ask why Dr. Bradley Nirenblatt and our team work so hard to give our patients straight teeth. Of course it’s nice to have a smile full of evenly-aligned teeth, but did you know that having straight teeth can also keep them healthier? In fact, straight teeth collect less plaque which make them less prone to decay and easier to keep clean! Flossing and other good dental health habits are also much easier when teeth are straight. With straight teeth leading to better oral hygiene, you are increasing your odds of keeping your own natural teeth for a lifetime! If you’re wondering whether your teeth might cause problems because they are out of alignment, please give Nirenblatt Orthodontics a call to set up a consultation. Dr. Nirenblatt can help you decide whether or not you will benefit from orthodontic treatment. At Nirenblatt Orthodontics, we strive to offer only the best orthodontic care. That means staying up to date on the latest technologies and orthodontic treatments. 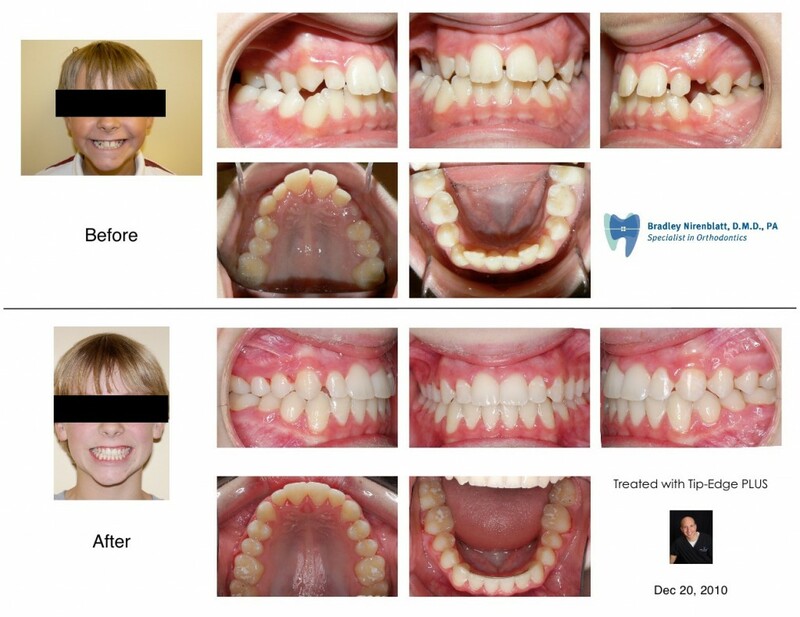 That's why Dr. Bradley Nirenblatt uses Tip-Edge PLUS brackets. Dr. Nirenblatt says that, "because of its small, single-wing design the PLUS Bracket System has plenty of inter-bracket width, allowing engagement of crowded teeth early on and easily in treatment. The vertical slot makes it easy to engage, upright and rotate teeth with spring auxiliaries if needed. Borderline extraction cases can be easily treated as non-extraction cases." In Fact, Dr. Nirenblatt's orthodontic cases have been chosen to represent TP Orthodontic's Tip-Edge Plus Brackets. There is even a link on their website for orthodontists to e-mail Dr. Nirenblatt with questions about Tip-Edge brackets. 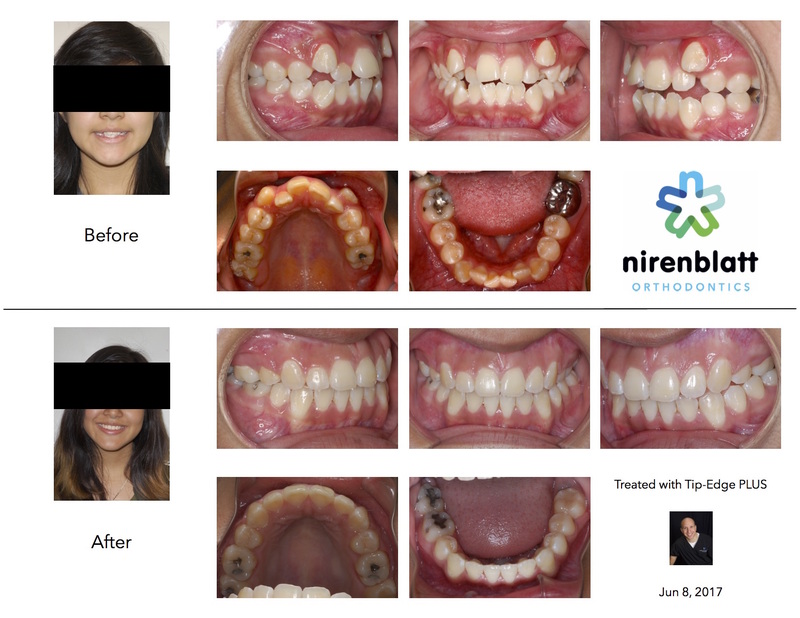 Dr. Nirenblatt has achieved successful treatment results for more than 10 years with Tip-Edge PLUS. If you have any questions about the Tip-Edge PLUS Bracket System, or to schedule a consultation with Dr. Nirenblatt, give our office a call! Happy October! For those who don't know, it’s National Orthodontic Health Month. This month-long event is organized by our pals at the American Association of Orthodontists, or AAO. Dr. Bradley Nirenblatt and our team realize that this is a great opportunity for us to raise awareness about the importance of oral hygiene. National Orthodontic Health Month also aims to recognize the dedicated work of orthodontists like Dr. Nirenblatt and other dental professionals in South Carolina. If you have any questions, please feel free to give us a call, ask us on Facebook, or ask us at Nirenblatt Orthodontics during your visit this month! Dr. Bradley Nirenblatt was recently named an Invisalign Premier Preferred Provider, one of the few in South Carolina! He is also one of the few Invisalign Teen experienced orthodontists. Also, Invisalign Teen and Radio Disney have teamed up for the Straight Up Celebration Sweepstakes! The Grand Prize is a trip for 4 to the Radio Disney Holiday Concert in Celebration, FL December 8-11. The winner will receive: Four roundtrip flights, four VIP tickets, first class hotel accommodations, and ground transportation! To enter and see the other prizes, visit the Invisalign website. Enter for your chance to win by November 6th! If you have been considering the Invisalign or Invisalign Teen treatments, give our office a call! "Today’s orthodontists have numerous types of brackets and prescriptions from which to choose. Our choice depends on what product we feel works best in our hands and will give us the best results for our patients. On the business side of our practices, we want a bracket that is reasonably priced, made of high quality materials, efficient in that it requires fewer appointments and is easy to finish cases with. I was first exposed to Tip Edge brackets during my residency at Columbia University in 1990 and for more than 10 years, I have chosen the Tip Edge Plus bracket to meet these stringent requirements. Because of its small, single-wing design the Plus Bracket System has plenty of inter-bracket width, allowing engagement of crowded teeth early on and easily in treatment. Because of its unique propeller design, the Plus Brackets allow me to begin correction of my patients’ malocclusion using light, two-ounce elastics from the day my patients get banded. Whether patients present with a Class II, Class III, deep bite, or open bite I begin correcting from day one when they are in the most motivated to see change happen. Rapid and early correction occurs because the Plus Bracket allows the tooth to tip in the direction I want, giving me greater control over the final outcome. One of the nicest things about using the Plus Bracket is the elimination of most bite jumpers, use of strong Class II elastics and headgear to correct Class II malocclusions. From a patient’s standpoint, this is one less bulky and awkward device they need to keep in their mouths or keep up with. Proper dental hygiene is also much easier to achieve without bulky appliances and hygienists from referring offices are much happier when they see my patients maintaining proper oral hygiene. The elimination of these appliances reduces overhead, is more comfortable for the patient and simplifies day-to-day practice operations allowing us to see more patients with fewer appointments. Also, emergency visits are reduced when fewer appliances are used. It’s a win-win situation for both patient and doctor as we see lower overhead and they spend less time in the chair." Nirenblatt Orthodontics is a proud sponsor of this year's Paws at the Park! This year there will be a fun walk, games, food, live music and activities for pets and their families. The event will also feature local animal experts and veterinarians who will be on hand to answer questions related to animal health. Be sure to check out the variety of educational exhibits with many different animals, vendors from all around the Lowcountry, and lots of treats for animals and their owners. "This one day festival will raise money to save countless animals lives, help feed and provide medical care for hundreds of animals, provide a day for education and family togetherness, and bring the community together toward a common cause." To learn more about the event and how you can donate, visit the website of the Charleston Animal Society. We look forward to seeing you there! All of these can reduce injuries. Only by using a mouth guard and other forms of facial protection can kids with and without braces avoid serious sports injuries. Be sure to avoid mouth guards that custom form to your teeth as these will resist any tooth movements Dr. Nirenblatt is trying to achieve. Give us a call if you have any questions about mouth guards or your treatment at Nirenblatt Orthodontics. True orthodontic emergencies are very rare, but when they do occur we are available to you. As a general rule, you should call the office when you experience severe pain or when you have a painful appliance problem that you can't take care of yourself. We’ll be able to schedule an appointment with Dr. Bradley Nirenblatt. You might be surprised to learn that you may be able to temporarily solve many problems yourself until you schedule an appointment with Nirenblatt Orthodontics. How can Invisalign improve your oral health? Healthy Gums: Straight teeth allow a close fit for gums. This lessens the gum stress that is caused by crowded or widely spaced teeth, thus also reducing red and swollen gums. Easy cleaning: Invisalign is removable, therefore brushing and flossing is easier and you are able to maintain a healthy mouth. These habits are vital to avoiding tooth decay, plaque and even gum disease. Improved speech and chewing: Properly-aligned teeth don’t have the discomfort or compound speech impediments that can be caused by crowded teeth or a deteriorating jawbone. If you have any questions about Invisalign, just ask Dr. Brad Nirenblatt the next time you’re in for an appointment. Or, you may post your question on our Facebook page! You can also read this article for more information on Invisalign and your oral health. Ask Dr. Nirenblatt: How can Invisalign improve my oral health? If you have any questions about Invisalign, just ask Dr. Bradley Nirenblatt the next time you’re in for an appointment. Or, you may post your question on our Facebook page! You can also read this article for more information on Invisalign and your oral health. If you ever sustain damage to your braces and need to call Nirenblatt Orthodontics, we can help you more effectively if you can tell us exactly which piece is in trouble! Here’s a handy diagram and corresponding list of all the parts that make up your braces. Elastic Tie: Tiny rubber band that fits around the bracket to hold the archwire in place. Archwire: The main wire that acts as a track to guide the teeth along. It's changed periodically throughout treatment, as teeth move to their new positions. Loop in Archwire: Frequently used for closing space left by an extraction. Many archwires don't have a loop. Bracket: Small attachment that holds the archwire in place. Most often, a bracket is cemented directly onto the tooth's surface, eliminating the need for a band. Headgear Tube: Round, hollow attachment on the back bands. The inner bow of the headgear fits into it. Coil Spring: Fits between brackets and over archwire to open space between teeth. Tie Wire: Fine wire that is twisted around the bracket to hold the archwire in place. Band: A thin ring of metal fitted around a tooth and cemented in place. The band provides a way to attach the brackets to the tooth. Hook: Welded or removable arm to which elastics (rubber bands) are attached. Elastic (Rubber Band): Small rubber band that is hooked between different points on the appliance to provide pressure to move the teeth. Hope this helps! Give us a call if you have any questions!